One of the things I have always loved about being a journalist is the opportunity to learn new things. This week's lesson: canine couture. Who knew? Well-heeled dogs, and their owners, everywhere, but not this cat person. 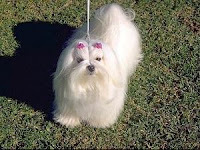 In the course of work for the Fox Valley Park District at a dog obedience class, I met two Maltese, one of whom was distinctly mini-Maltese, being a puppy. Each was wearing an Oscar Newman sweater -- the seasonal variety, of course, for December. (Oscar is being a little possessive about images of his upscale sweaters, but click on the link above for a peek.) Modern Dog magazine chronicles the lifestyle of the urban dog, and Paris Hilton did something useful in this world in designing dogwear .